57 When it was evening, there came a rich man from Arimathea, named Joseph, who himself had also become a disciple of Jesus. 58 This man went to Pilate and asked for the body of Jesus. Then Pilate ordered it to be given to him. 59 And Joseph took the body and wrapped it in a clean linen cloth, 60 and laid it in his own new tomb, which he had hewn out in the rock; and he rolled a large stone against the entrance of the tomb and went away. 61 And Mary Magdalene was there, and the other Mary, sitting opposite the grave 62 Now on the next day, the day after the preparation, the chief priests and the Pharisees gathered together with Pilate, 63 and said, "Sir, we remember that when He was still alive that deceiver said, 'After three days I am to rise again.' 64 "Therefore, give orders for the grave to be made secure until the third day, otherwise His disciples may come and steal Him away and say to the people, 'He has risen from the dead,' and the last deception will be worse than the first." 65 Pilate said to them, "You have a guard; go, make it as secure as you know how." 66 And they went and made the grave secure, and along with the guard they set a seal on the stone. "Joseph, who himself had also become a disciple of Jesus" (v.57b), we are reading here, and in the collateral text with John we read about this rich man: "After these things Joseph of Arimathea, being a disciple of Jesus, but a secret one for fear of the Jews." (John 19:38). The cowardice and the fear of man is certainly something that sticks deep in our nature independent of class and position, but also here become e.g. riches and privileges quickly a snare, that does it further more difficult to follow conscience and conviction - it is so much to lose. Think of Paul in this connexion, with his possibilities for a "shining" future - as it is called. He renounced it all, yes, counted it as loss (garbage). (Phil. 3:7). What man looked upon as a great gain, Paul looked upon as loss! Can there be greater contrast! He saw it like that, scaled up against to own Christ. The worlds favour, privileges and riches, own righteousness, own holiness and own doings on the one hand, and so only one thing on the other: Christ! In Him we have in reality everything, says The Word of God. - Without Him we have in reality nothing. That will be revealed at the end, when we even lose our soul. Joseph, in spite of the cowardice he struggled with, saw this: In Him the Lord Himself is present among us, and "all that we need for heaven and earth," is given us in Him. And in the collateral text with Mark we read about him that he "gathered up courage and went in before Pilate, and asked for the body of Jesus.” (Mark 15:43). It was certainly not without risk to stand forward as a friend of Jesus in those days, when the devil raged on his worst in his servants, to eradicate all that could promote Jesus’ act. And Pilate was no good man in any way. It is not written that much about him in The Scripture, but i.a. this: "Now on the same occasion there were some present who reported to Him about the Galileans whose blood Pilate had mixed with their sacrifices." (Luke 13:1). This man was the one Joseph went in to and asked for Jesus’ body. - Jesus who indirectly had brought Pilate in this pinch towards the Jews, and caused him this humiliation that he had to do as they wanted. Certainly, Joseph really had to "gather up courage" to go in to him! And he did not fetch this courage from his own heart, but from the faith. It is an act of faith we are witnessing here. We are now going to have a look at how God has control with it all, and how it is expressed also in this text. First, how Joseph acts here, and testifies about Jesus, without being aware of it. But that is how it is, when a person comes to believe in Jesus and wants to follow Him, it is not as we usually think, and so many preach, that now we have to do Christian doings of all kinds, and so to speak by that testify about Jesus. No! Whoever has come to believe in Jesus is already a Jesus witness (servant) by that! (See i.a. Rom. 6:18). And as sure as he stays in this belief, God will testify by him, like He is doing it by Joseph here. Joseph who in spite of all danger, in spite of the favour and benefits of the world he has to lose, in spite of his cowardice and fear of man, goes in to Pilate in this particular errand, and testifies by that to all man that he believes in Jesus. But still more he testifies, for the one who has got the faith’s eye, when he is laying the dead body of Jesus in his own new grave (v.60), and roles a great stone in front of the hole! But as you probably see, this is actually not Josephs testimony about Jesus, but Gods. It is the true testimony, which we are just channels for, if we are true disciples. I.e. believers. It is accordingly not talk about everything that we shall do for Jesus - it is rather talk about, whether we can be so small that Jesus can use us to all that He wants to do, both for us and for other people. What Joseph says loudly here - as mentioned without being aware of it - is: Jesus died in my place! "It was one who was willing to die in my place, so that I should be living by Him," says the same faith in a song, about two thousand years later. It is the same faith that testifies like this! It is Jesus faith! The Spirits testimony which we get part in as a free and undeserved gift! In this belief, Joseph, would do what was right to him, not only right for the head, intellectually, according to what he had learnt was right and correct, but of the heart now. He wanted to do something for Jesus! Not to become a Christian, still less a better Christian, but simply because Jesus had become such for him as He had. He had simply been a true believer, and gave thereby slip of his own, for Jesus’ sake. Risked it all, for His sake! Here we are seeing a practical example of one who does not live for oneself any longer, but for Him who died (and later on should arise) for him. It is only the faith that can work this. Everything else cannot be anything else than hypocrisy, even if one surrender ones body to be burned. (1 Cor. 13). What above all must happen in your life is accordingly this - that you get the right knowledge of Jesus! Therefore justifies Jesus this Mary’s‘ place by His feet also, as a place that shall not be taken away from her. (Luke 10:39-42). It is accordingly not talk about to ride out to do great "knight-deeds" and monumental works - that is always grounded on dirty motives - but to be absolutely silent before The Lord, so one can learn to know the truth by His Word, and then one will also be used by Him, precisely as Mary who poured the very costly perfume of pure nard over His head and anointed His body beforehand for the burial. (Mark 14:3). She, who had sit by Jesus’ feet and listened to His words, more than to be taken up with being a "Jesus disciple" as the others, she saw what the others did not see, and understood what the others did not understand: Jesus are going to die for me! She was acting according to a relation of the heart towards Jesus. Jesus here saw a fruit of His own act, His own preaching, and His own Word - therefore is He also saying about this Mary’s act: "Truly I say to you, wherever the gospel is preached in the whole world, what this woman has done will also be spoken of in memory of her." (Mark 14:9). And now are you hearing it! The testimony about Mary? No, properly speaking not, but the testimony about what she did! - because that basically was an act by God - a fruit of the Gospel! So is also what you read about Joseph here. And in short it is also testified here about two others with the very same “relation of the heart” towards Him - two whom we hear more about in the next chapter with Matthew - that is "Mary From Magdala and the other Mary." (v.61). But now God is dependent of our willingness? He can probably not get to accomplish anything without our willingness? Certainly, much of the preaching gives us exactly that impression, and that understanding. There are so many places in The Scripture that speak directly against this, but we shall just keep to our text: "Now on the next day, the day after the preparation, the chief priests and the Pharisees gathered together with Pilate, and said, "Sir, we remember that when He was still alive that deceiver said, 'After three days I am to rise again.' "Therefore, give orders for the grave to be made secure until the third day, otherwise His disciples may come and steal Him away and say to the people, 'He has risen from the dead,' and the last deception will be worse than the first." Pilate said to them, "You have a guard; go, make it as secure as you know how." 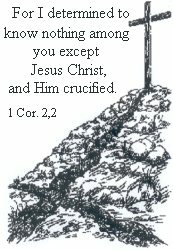 And they went and made the grave secure, and along with the guard they set a seal on the stone." (v.62-66). It was - and is - not all who had/have the same relation of the heart towards Jesus. But we shall be aware of, that in both cases it is talk about precisely a relation of the heart! When a person is forced into the light, and has to, openly show his attitude towards Jesus - then is also precisely a relation of the heart revealed. A relation of the heart, which all along has been there, but could be kept hidden as long as the darkness prevails. Then one think one can place oneself indifferent towards Him, something that in reality is impossible. These we read about here had had so much to do with Jesus directly, that it no longer was possible to hide in the darkness. They were openly, and evidently, enemies. And they had paid more attention to Jesus‘ word and testimony, than many a disciple: "We remember that when He was still alive that deceiver said, 'After three days I am to rise again. '” (v.63). They had apprehended this, but they did not believe Him. Straight on they are mentioning Him as "that deceiver." They have, as known, plentiful of spiritual relatives today too! But let us now ask: Could God use them? Certainly He could use them! As Joseph says to his brothers in Gen. 50:20: ”You meant evil against me, but God meant it for good in order to bring about this present result, to preserve many people alive." So it is here too - they meant to do harm - to prevent that the Gospel about Jesus should be spread, and save the life of many people. They were just as little aware of this, as Joseph of Arimathea was aware that he witnessed about Jesus‘ resurrection. But the Spirit who urged them knew what it was all about. But God turns it to good here too, and uses the devils cunning against himself. What they worked on here should after all finally put paid to Jesus. Instead it becomes a mighty affirmation of His resurrection. They were thinking so low - as if His disciples would come and steal His dead body - and with that mess up some deceit. "The thief believes that every man is stealing," says a saying. They were thinking that this was something that was on such a level that they could prevent it - at least with the help of Romes power. The grave got the mighty seal of Rome. Who would dare to infringe that? That was connected with death penalty of course. In addition there was a guard of roman soldiers. This reminds of the prophet Eliah in his fight with the many false Prophets of Ba‘al, when he called for fire from heaven, he did it so "difficult as possible to God!" He poured water out over the offering and the wood three times, so the water was floating around the altar and filled the trench around. Then he called for the Lords intervention. You can read about the result in 1 Kings. 18. Like that it happens, so to speak, here too. It is done so difficult as it stands in human power to do it. Anything more mighty than the seal of Rome did not exist on earth at that time. But it goes as the singer witnesses in the well-known Easterpsalm: "He raised with divine might!" (Norw.songbook). What about Romes power and seal? : ”The guards shook for fear of him (the angel) and became like dead men." (Mat. 28:4). And they who directly called Jesus, the deceiver - that is, the liar - they themselves must reveal as exactly that: "And when they had assembled with the elders and consulted together, they gave a large sum of money to the soldiers, and said, "You are to say, 'His disciples came by night and stole Him away while we were asleep.' "And if this should come to the governor's ears, we will win him over and keep you out of trouble.” (Mat. 28:12-14). Where do you find the deceiver and the liar here? The whole elite must here themselves appear as exactly what they accused Jesus to be! Do not be deceived, God is not mocked! (Gal. 6:7).